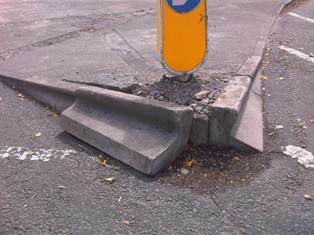 The damaged corner of paving at Western Avenue junction Aberporth Road has been inspected and the necessary remedial work will be carried out as soon as is reasonably practicable. Due to the location of the defect and the nature of the road i.e. traffic flow; located at a junction etc. work can only be undertaken on a Sunday for reasons of safety to both the workforce and road users.